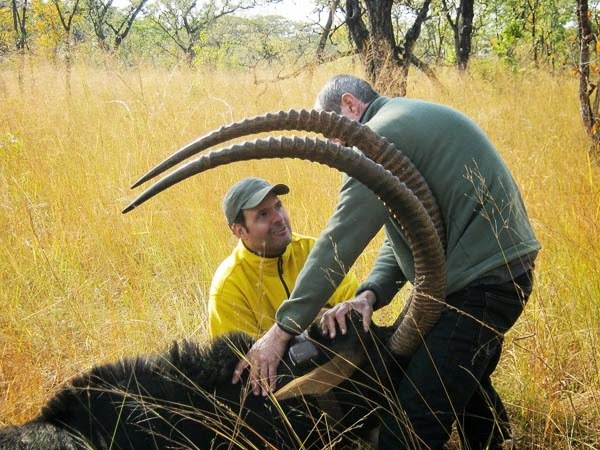 Scroll down to see highlights from Pedro Vaz Pinto’s Giant Sable 2013 Capture Operation report. 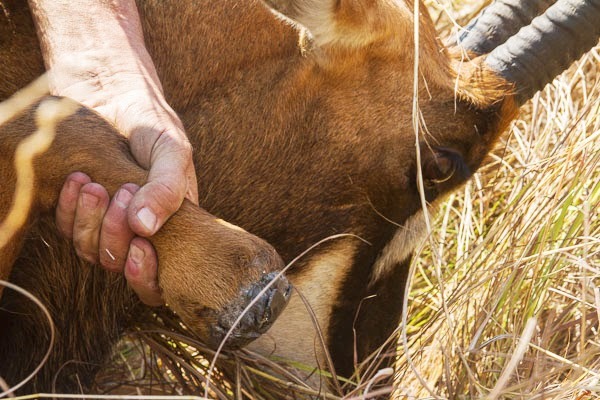 Veterinarian Pete Morkel and Pedro setting a collar. 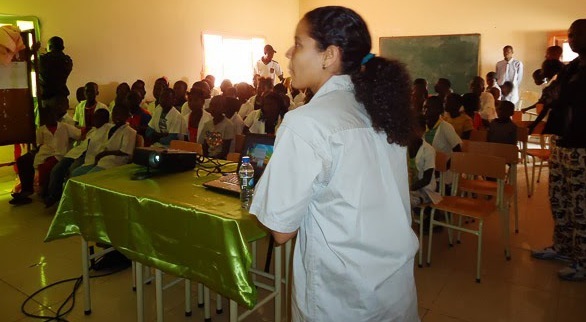 Sendi making an educational presentation for public schools in Cangandala. 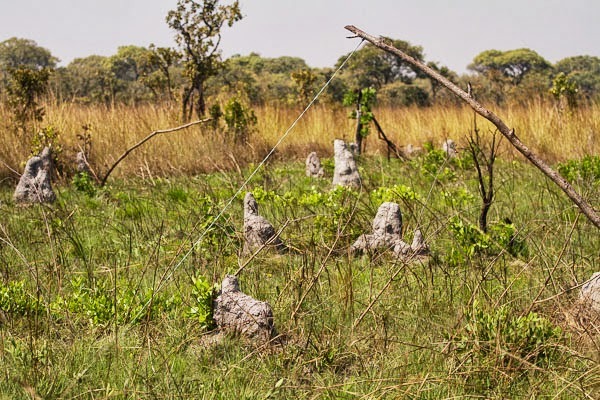 Visit our Giant Sable page to read biologist Pedro Vaz Pinto’s 2013 Capture Operation Report with photos from Angola’s Cangandala Park and Luando Special Reserve, in English and Portuguese. 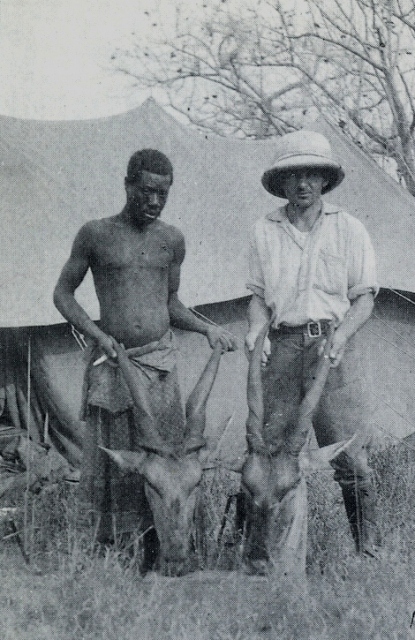 Beebee collected a male and female antelope head of each of the 22 species of antelopes in Angola. The time, 1917 World War I….. 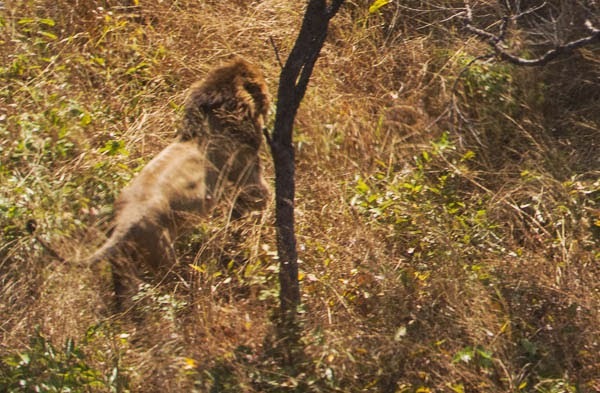 The place, the Portuguese province of Angola in West Africa…..The assignment, find oil to fuel the machines of war….The Man, American geologist and hunter extraordinaire, Chan Beebee….. 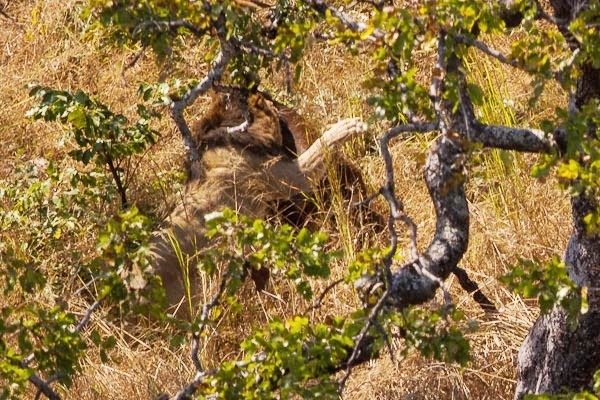 The Angola Field Group invites you to the presentation of ‘Cannibals and Big Game’, at the Viking Club, Thursday, Dec. 02, at 8:00 PM. Liz standing on hippo. 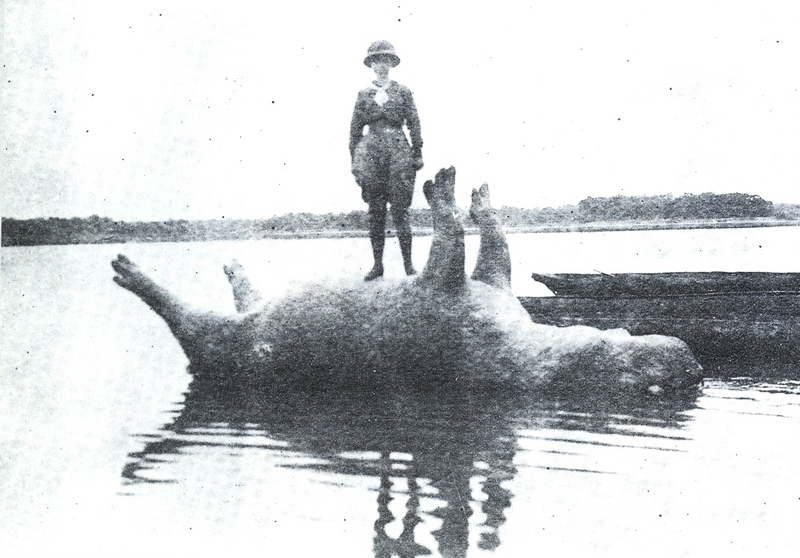 After a hippo has been killed, it always sinks, remaining under water about two hours or until enough gas has formed in its stomach to float the animal to the surface. Come hear the true story of the exploits of Chan and his young bride Liz as they trek through what is today the province of Bengo, with their safari of 80 carriers, looking for oil but finding mostly hippos and buffalo and other big game not to mention a few cannibals. Excerpts from Chan’s memoir ‘Cannibals and Big Game’ will be presented by Bohdan, Christian and Tako of the Viking Club. Photos from the book will be projected on the big screen. 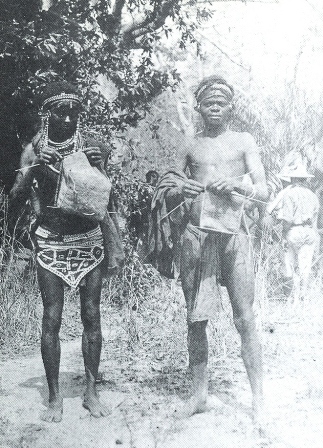 Quissama warriors knit their own shoulder bags for carrying powder, bullets and other items needed in the field. Everybody is welcome to attend the presentation. In close cooperation with the Viking Club, this event is offered free of charge. Alcoholic and non-alcoholic beverages and snacks are sold at the bar, coupons must be purchased. The Viking Bar opens at 7:30 PM! If you would like to have a map showing the location of the Viking Club, click here. The Viking Club is on the main floor of the former Swedish Building at Rua Marien N”Guabi, No 118 in Maianga, across the street from the new Panela de Barra restaurant. Soba Cahala, king of the Quissama cannibals, was highly respected for his shrewd battle tactics and abiding hatred of the white man. 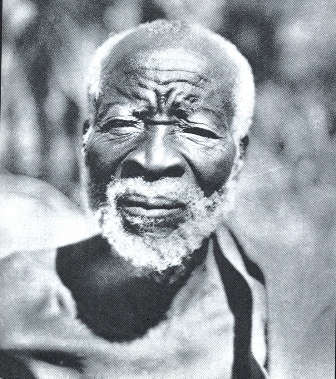 Beebee was responsible for having him imprisoned at Muxima fort on the Kwanza River where the fierce fighter was kept in a pit for 8 days by the Portuguese military chief.